detectors to discover a new particle. After decades of searching and many promising results that didn't pan out, scientists working at the Large Hadron Collider in Europe announced Wednesday they had found a new particle. People got really excited, and for good reason! This discovery is significant no matter how you look at it: If the new particle is the Higgs boson (which it probably is), it provides the missing piece to complete the highly successful Standard Model of particles and interactions. If the new particle isn't the Higgs boson, well...that's interesting too. Q: What is the Higgs boson? A: The Higgs boson is a particle predicted by the Standard Model. It's a manifestation of the "Higgs field", which explains why some particles have mass and other particles don't. Q: Whoa, too fast! What's a boson? A: A boson is a large mammal indigenous to North America. No wait, that's bison. [Ed note: Ha. Ha. Ha.] On the tiniest level, there are two basic types of particles: fermions and bosons. You're made of fermions: the protons, neutrons, and electrons that are the constituents of atoms are all fermions. On a deeper level, protons and neutrons are built of quarks, which are also fermions. Bosons carry the forces of nature; the most familiar are photons--particles of light--which are manifestations of the electromagnetic force. There are other differences between fermions and bosons, but we don't need to worry about them for now; if you want more information, I wrote a far longer and more detailed explanation at my personal blog. Q: What does it mean to be a "manifestation" of a force? A: The ocean is a huge body of water (duh), but it's always in motion. You can think of waves as manifestations of the ocean's motion. The electromagnetic field (which includes stuff like magnets, electric currents, and light) manifests itself in waves, too, but those waves only come in distinct indivisible chunks, which we call photons. The Higgs boson is also a manifestation of a special kind of interaction. Q: How many kinds of forces are there? A: There are four fundamental forces of nature: gravity, electromagnetism, and the two nuclear forces, creatively named the weak and strong forces. Gravity and electromagnetism are the forces of our daily lives: Gravity holds us to Earth, and electromagnetism does nearly everything else. If you drop a pencil, gravity makes it fall, but your holding the pencil is electromagnetic, based on how the atoms in your hand interact with the atoms in the pencil. The nuclear forces, on the other hand, are very short-range forces and are involved in (wow!) holding the nuclei of atoms together. Q: OK, so what does the Higgs boson have to do with the fundamental forces? A: All the forces of nature have certain things in common, so physicists from Einstein on have tried to describe them all as aspects of a single force. This is called unification, and to this day, nobody has successfully accomplished it. (Sounds like a metaphor for something or other.) However, unification of electromagnetism with the weak force was accomplished, yielding the electroweak theory. Nevertheless, there was a problem in the first version: It simply didn't work if electrons, quarks, and the like had mass. Because particles obviously do have mass, something was wrong. That's where the Higgs field and Higgs boson come in. Scottish physicist Peter Higgs and his colleagues figured out that if there was a new kind of field, it could explain both why the electromagnetic force and weak force behave differently and provide mass to the particles. Q: Wait, I thought mass is fundamental? A: One of the insights of modern physics is that particles aren't just single objects: They are defined by interactions. Properties of particles emerge out of their interactions with fields, and mass is one of those properties. (That makes unifying gravity with the other forces challenging, which is a story for another day!) Some particles are more susceptible to interacting with the Higgs. An analogy I read (and apologies for not remembering where I read it) says it's like different shoes in the snow. A snowshoe corresponds to a low-mass particle: very little snow mass sticks to it. A high-mass particle interacts strongly with the Higgs field, so that's like hiking boots with big treads: lots of places for the snow to stick. Electrons are snowshoes, but the heaviest quarks are big ol' hiking boots. Q: Are there Higgs bosons running around all over the place, just like there are photons everywhere? A: No, and it's for the same reason we don't see the bosons that carry the weak force. Unlike photons, the Higgs boson and the weak force bosons (known as the W and Z bosons -- our particle physics friends run out of creative names sometime) are relatively massive. Many massive particles decay quickly into less massive particles, so the Higgs boson is short lived. Q: So how do you make a Higgs boson? A: The Higgs field is everywhere (like The Force in Star Wars), but to make a Higgs boson, you have to provide enough energy to make its mass. Einstein's famous formula E = mc^2 tells us that mass and energy are interchangeable: If you have enough energy (in the right environment), you can make new particles. The Large Hadron Collider (LHC) at CERN in Europe and the Tevatron at Fermilab in the United States are two such environments: Both accelerate particles to close to the speed of light and smash them together. If the collisions are right, they can make a Higgs boson. Q: Is this new particle actually the Higgs boson then? A: That's somewhat tricky. While the Standard Model predicts the existence of a Higgs boson, it doesn't tell us exactly what the mass should be, which means the energy to make one isn't certain. However, we have nice limits on the mass the Higgs could have, based on the way it interacts with other particles like the other bosons and quarks. This new particle falls in that range and has other characteristics that say "Higgs." This is why a lot of physics writers, including me, will say the new particle is probably the Higgs boson, but we'll hedge our bets until more data come in. The particle is real, though: four different detectors (ATLAS and CMS at CERN, and DZero and CDF at Fermilab) all saw the same particle with the same mass. Q: But I'm asking you as a friend: Is this the Higgs boson? A: I admit: a perverse part of me hopes it's something different. If it isn't the Higgs boson, it's something unexpected and may not correspond to anything predicted in any theory! That's an exciting and intriguing result. However, my bet is that this is the Higgs boson, and many (if not most) of my colleagues would agree. Q: What's all this talk about the "God particle"? 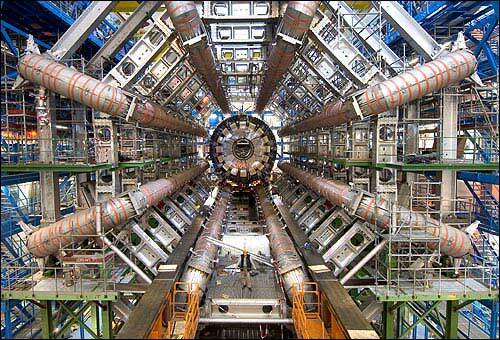 A: Physicists HATE it when the Higgs boson is called "the God particle." Yes, the particle is important, but it's not godlike. The term came from the title of a book by physicist Leon Lederman; he originally wanted to call it "The Goddamn Particle", since the Higgs boson was so frustrating to find, but his editor forced a change. Q: Why should I, as a non-physicist, care about this stuff? A: While it's unlikely that the discovery of the Higgs boson will affect you directly, particle colliders like the LHC and Tevatron have spurred development of new technologies. However, that's not the primary reason to study this. By learning how particles work, we learn about the Universe, including how we fit into it. The search for new particles meshes with cosmology (my own area): It reveals the nature of the Universe we inhabit. I find a profound romance in exploring our Universe, learning about our origins, and discovering things that are far from everyday. If we limit the scope of exploration only to things that have immediate practical use, then we might as well give up on literature, poetry, movies, religion, and the like right now. Q: If this is the Higgs boson, is that the final piece of the puzzle? Is particle physics done? A: No, and in fact bigger mysteries remain. The Higgs boson is predicted by the Standard Model, but we know 80% of the mass of the Universe is in the form of dark matter, stuff that doesn't emit or absorb light. We don't know exactly what dark matter is, but it's probably a particle -- which means particle colliders may be able to figure it out. Hunting for an unknown particle is harder than looking for one we are pretty sure exists. Finding the Higgs (if I may quote myself) is like The Hobbit: It's a necessary tale, but the bigger epic of The Lord of the Rings is still to come. I'm confused. If the reason that something has mass is because of its HBs then how can HBs be short-lived? Where does my mass come from if I'm not full of HBs? Particles all interact with the Higgs field, which is always around. Higgs bosons are manifestations of the Higgs field, and they aren't always around: they require a lot of energy to pop into being. So, it's the Higgs field that makes mass, and the Higgs boson is evidence that the Higgs field exists. Does that help? Thank you for this enlightening post, that clarifies a lot of concepts !